There are various ways of fixing the problem. Bringing less oil up from the Gulf would seem to be part of the solution. Conoco Phillips, one of the owners of the Seaway pipeline (and an owner of Midwest refineries), says it is not interested in reversing it. But lower prices by themselves would seem to result in less oil being shipped through the pipelines up from the Gulf, and may at least partially fix the problem. Trucking and rail transportation of oil to the Gulf Coast may also be part of the solution, but arranging this may take some time, because of the large quantities involved. If shipping by train or truck is worked out, I would expect that the price of WTI will move closer to Brent, to reflect the additional shipping cost involved, perhaps $10 or $15 a barrel. The availability of this solution should help to cap the spread between West Texas Intermediate and Brent. Figure 1. Comparison of Brent and West Texas Intermediate spot prices, based on data of the US Energy Information Agency. 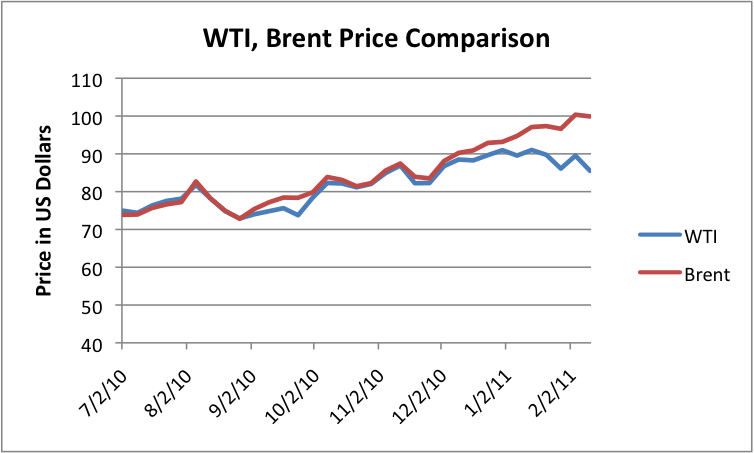 Inspection of Figure 1 indicates that the gap between Brent and WTI prices started in December 2010, and has widened in 2011. Below the fold, I show some more details about what is happening and the prospects for getting the gap fixed. Underlying all of this is rising oil production in “PADD2” (the EIA’s designation for the Midwest, which includes the Bakken in North Dakota) and also rising imports into PADD2 of crude oil from western Canada. Figure 2. Imports from Canada into PADD2. Graph by EIA. Figure 2 shows the oil imported into PADD2 from Canada. While imports have been rising since 1990, there has been no spectacular recent rise in the amount of oil coming into the US from Canada. A closer look at the last eight months (shown in Figure 3, below) shows that there have been ups and downs, which I will later show correspond to the timing of pipeline closures and operation at reduced pressure because of spills. Figure 3. 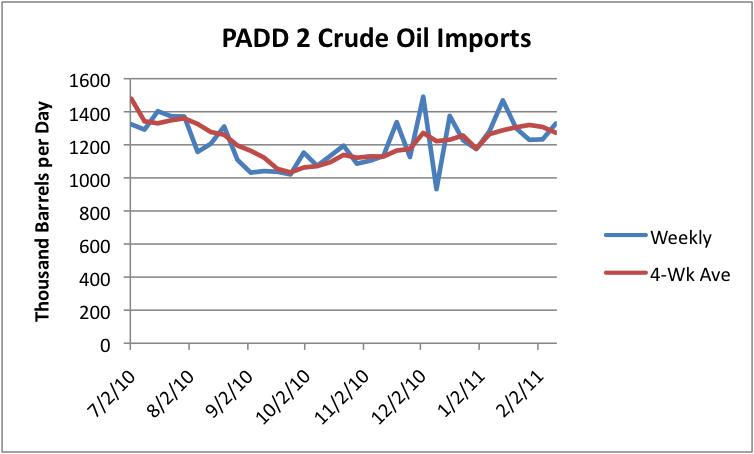 Crude oil imports since July 2010 into PADD2, based on EIA data. The production that appears to be increasing rapidly is production from the Bakken region in North Dakota. Figure 4. Production for PADD2, through November 2010, based on EIA data. Thus, it appears that US PADD2 production has recently increased by a high percentage, but relative to a low base, while imports from Canada are generally rising, although not necessarily by very much recently. Both would tend to put pressure on Midwest refinery capacity, if the area were already up against limits, but probably not otherwise. We have all heard that these Midwest refining capacity is inadequate. EIA doesn’t give much history of refinery capacity by region, but apparently, the Midwest at one time had more capacity than it does now. Figure 5. 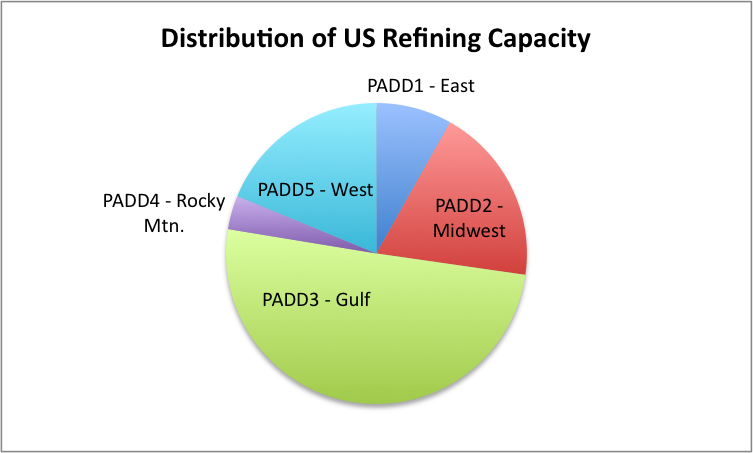 Current distribution of US refinery capacity, based on EIA data. Currently, the Midwest has about 18% of US refining capacity, amounting to about 3.3 million barrels a day. Imports from Canada from Figure 2 or 3 would appear to be about 1.3 million barrels a day, and PADD 2 production would appear to be about 800,000 barrels a day, making a total of roughly 2.1 million barrels a day. This is not enough oil to supply Midwest refineries, and the reason for pipelines from the Gulf. Consumption of oil products in the Midwest is about 4.9 million barrels a day, considerably more than it refines, so the Midwest also depends on imports of oil products from other parts of the country for its needs. There are two crude pipelines from the Gulf to the Midwest. The Seaway Pipeline with a capacity of 430,000 barrels a day brings oil up from the Gulf coast to Cushing, while the Capline pipeline, with a capacity of 1,200,000 barrels a day, brings crude from Louisiana to Southern Illinois. It is the conflict of the crude oil coming from the North with the crude oil coming from the South that is causing the oversupply of crude oil to Midwest refineries. It should be noted that some refineries have been set up to handle very heavy oil from Canada, and others have not. There are also other differences in refineries that make some better for some types of crude oil than for other types. Because of this, even if the total amount of crude oil were to match up precisely with the available Midwest capacity, there might still be refineries with not enough crude and others with too much. According to EIA data, PADD2 (Midwest) refineries are running at 95% of capacity, while other refineries are running at much lower percentages of capacity. Some of the other “PADDs” are running at 75% of refinery capacity–too low to make a profit. The level of refinery utilization tends to vary by the time of year–this is an unusual time for utilization to be so high. If utilization is high now, a “normal” summer rise in utilization would not really be possible. 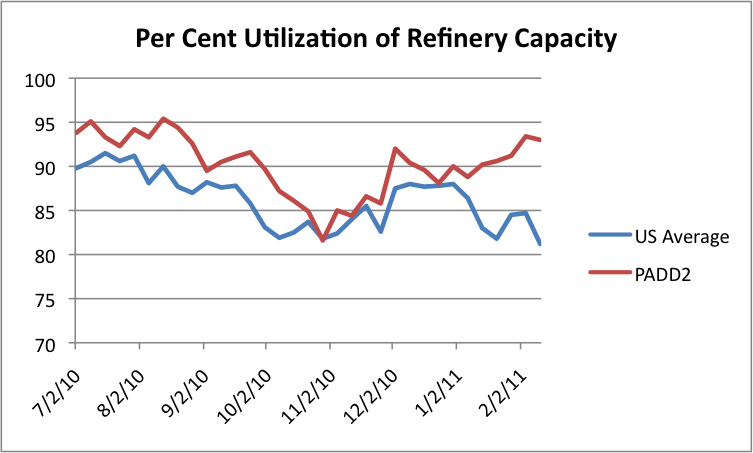 So effectively “maxing out” at refinery utilization seems to be part of the problem. Since the buyers of crude oil are generally refineries, if they have all the oil they can take, they are not going to bid very much for more crude oil, except perhaps out in the future, when they aren’t so overbooked, and this seems to be the pattern we are seeing for West Texas Intermediate. Figure 7 shows that it is not all that unusual for the industry to run at 95% utilization of operable capacity. US overall utilization of US refineries is down considerably since the 1995 to 2005 period. There is clearly plenty of capacity in the US, outside of PADD2, if oil could get transported to the right location. Part of the problem seems to be pipeline issues–particularly new pipelines that don’t go to the Gulf. There are really two new pipelines. The first is Enbridge’s Alberta Clipper Line. It opened in April 2010 and carries up to 450,000 barrels a day from Hardisty, Alberta to Superior, Wisconsin. From there, it is added to existing US pipelines. Figure 8. Map by Canadian Association of Petroleum Producers, showing pipeline status as of July 2010. The Enbridge Alberta Clipper is the red line (labeled with a “1”), connecting up with Superior, Wisconsin. This pipeline no doubt accounts for whatever increase in PADD2 imports occurred since early 2010, which from Figure 2 above, doesn’t appear to be much. One reason that the Alberta Clipper doesn’t seem to actually be doing very much to increase US imports is the fact that it appears to have been built for a bigger increase in Canadian production than actually took place, so is running under capacity. The other reason for the lack of increase is because of leak-related shut downs and reductions in capacity in US pipelines. First, on July 8, 2010, there was a spill in Michigan on the Line 6B (built to carry 290,000 barrels a day, but carrying 190,000 barrels a day). Then, on September 9, there was a leak discovered outside of Chicago in Line 6A (built to carry 670,000 barrels a day, but carrying 459,000 barrels a day before the leak). Both of these leaks were repaired, but Enbridge was ordered to run the pipelines at lower pressure afterward. One report said the reduction in pressure had the potential to reduce deliveries of Line 6A by 300,000 barrels a day. The long and short of this is that while the April 1 increase in pipeline capacity theoretically had the potential to increase deliveries, the closures and reduced pipeline pressures (which reduced the flow rate) prevented much of an actual increase in deliveries. I would not be surprised if we continue to have problems with leaks. There seem to be real issues with putting heavy crude through very old US pipelines–see my post on this issue. A second new pipeline, Trans Canada’s Keystone Pipeline with a capacity of 590,000 barrels of crude oil a day, was added in February 8. It is labeled with a numeral “2” on Figure 8. Since it opened so recently, the effects would not yet appear in Figure 3 amounts. The new section brings oil from Steele City Nebraska to Cushing, and raises capacity on the line by 145,000 barrels per day. The addition of this line appears to have the potential to bring more oil into the Midwest, where refining capacity is already “maxed out”. It seems to me that the opening of this line is a major part of what is scaring refineries, since they already have as much crude oil as they can handle from other sources. They are offering low prices for additional oil, recognizing they cannot really handle more. A graph of recent PADD2 storage (the entire amount, not just Cushing) is shown in Figure 9. Figure 9. PADD crude oil storage inventory. Graph made by EIA. Clearly, crude oil in storage was already on an upward trend before the Alberta Clipper pipeline opened on April 1, 2010. If we compare the recent changes in inventory to what has happened with PADD2 imports (Figure 3), we see that there seems to be a close correlation. Between the opening of the pipeline and the day of the first spill (July 26, 2010), inventory increased from 85.0 million barrels to 97.7 million barrels. This was an increase of 12.7 million barrels in about 116 days, indicating that PADD 2 was accumulating inventory at a rate of about 109,000 barrels a day. Once the first outage began, inventory was drawn down, reaching about 90.7 million barrels when Line 6B was finally put back on at a reduced rate on September 27, 2010. Figure 3 shows piped oil imports began increasing about November 1, 2010. Between November 1 and February 11, inventories increased from 90.7 million barrels to 99.2 million barrels, an increase of 8.5 million barrels in 102 days, or 83,000 barrels a day of inventory accumulation. So it looks as if PADD2 was not able to handle the additional crude oil added by the Alberta Clipper during the times it increased flow from Canada. It is not surprising that refineries are worried about the Trans Canada’s Keystone pipeline expansion coming on line February 8, adding even more potential crude oil supply. Are the new low crude oil prices reducing PADD2 gasoline prices? This is a graph comparing PADD2 gasoline prices to US average gasoline prices. Figure 10. 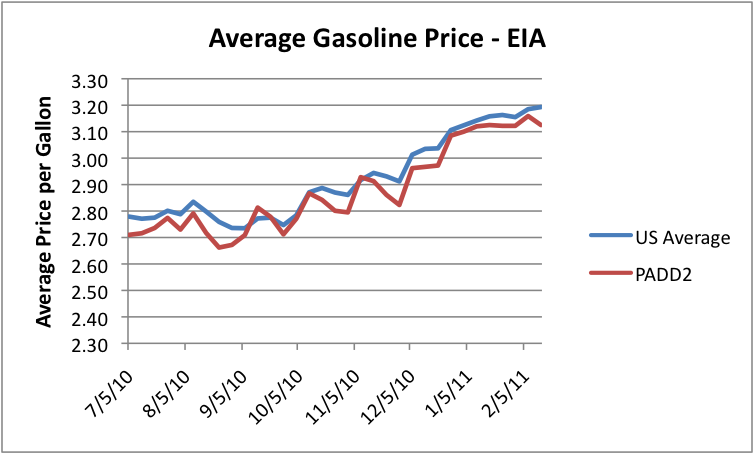 PADD2 average gasoline price compared to US average gasoline price, based on EIA data. The lower prices that refineries have been paying for crude in PADD2 do not seem to be translating to lower gasoline prices. There would seem to be three reasons for this. First, demand for products, like gasoline, remains high in the Midwest. It is crude oil that is oversupplied, because of pipeline issues and other factors. Second, it is not clear whether refineries actually paid the reduced prices that we have been seeing recently. They may have had long-term contracts or have hedged their costs, so that they did not benefit from the reduced price for WTI. Third, since PADD2 consumes more oil products than it produces, it is importing oil products refined elsewhere, and must pay the “going rate” for them. How will all of this resolve? Some have suggested that TransCanada’s Keystone XL pipeline (labeled as “3” on Figure 8 ) will help solve the problem, when it is completed in 2013. I am not so sure. For one thing, the pipeline hasn’t been approved yet, and it has substantial opposition in the US. Furthermore, unless Canadian production really ramps up, it is not clear that there will be enough crude oil to fill another pipeline. There are already two recent pipelines bringing more oil into PADD2, and they are likely nowhere near full. Canada also has options for sending its crude elsewhere–see pipelines to the West Coast, labeled “4”, “5”, and “6” on Figure 8. To handle our current problems, what seems to be needed is a pipeline specifically from Cushing to the Gulf coast. Even this piece of the Keystone XL pipeline has substantial opposition, and won’t be available until 2013, assuming it is approved and moves ahead as planned. 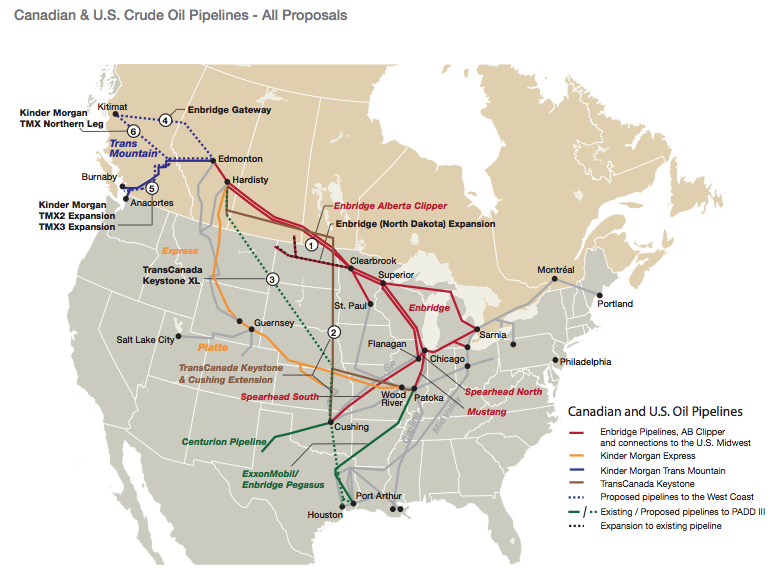 If the portion of Keystone XL from Canada is added as well, it will also be bring more crude from Canada, adding to the amount of oil that needs to be transported to the Gulf Coast. The new segment to the Gulf Coast may not add much more capacity than what is being brought south by the new line. As mentioned in the introduction, there is a 430,000 barrel a day crude oil pipeline that brings crude oil up from the Gulf Coast to Cushing, called the Seaway Pipeline. If it were reversed, it theoretically might solve the problem, assuming that each refinery could still get the type of crude it needs. ConocoPhillips, a partial owner of Seaway, has said it is not interested in reversing the pipeline. Conoco Phillips operates refineries in the Midwest, and stands to make money if there is a large gap between crude oil prices and the selling prices of products (in other words, crack spread). But there may be other reasons for wanting the pipeline to continue flowing in toward Cushing. A 860,000 change in capacity (from +430,000 to -430,000) would a big change to digest, even for a PADD that is oversupplied. If the selling price of crude oil in the Midwest remains depressed long enough, sellers will find other markets for their crude oil, and the Seaway and Capline pipelines bringing oil up from the Gulf will operate at reduced capacities. That would be one solution to the PADD2 crunch. If the situation is bad enough, long enough, it is possible that the Seaway Pipeline owners will relent and turn the pipeline direction around, so it pumps oil toward the Gulf, instead of up to Cushing. Another option is railroad or truck shipping of oil from the Midwest down to the Gulf Coast. According to Dennis Gartman, the cost of shipping crude from Cushing to the coast is $10 barrel by truck and $6 barrel by train. If there really is sufficient train and trucking capacity, this would seem to be the approach to use. A person would think the price differential would then be reduced to the additional transit cost, or the additional transit cost, plus a small margin. The price differential between Brent and WTI would then go back to $10 or $15 barrel. One way or another, the gap between WTI and Brent prices seems to unlikely to continue growing, and I would expect the differential to eventually start dropping. It nothing else, as the total supply of oil drops, there will be less oil to fill pipelines from the Gulf to the Midwest, making more opportunity for locally produced oil to use the local refineries. This entry was posted in News Related Post and tagged Brent, oil prices, West Texas Intermediate, WTI. Bookmark the permalink. 25 Responses to Why are WTI and Brent Prices so Different? since 5 weeks (see http://www.eia.doe.gov/dnav/pet/pet_stoc_wstk_dcu_YCUOK_w.htm) inventories in Cushing are flat, not increasing as it is frequently reported in all kind of media. Inventories are since weeks 37-38 mio barrel against a capacity of 55, and capacity which will further increase by 25% this year. Why is this considered as overstocked or glut ? The market seems to ignore this and media just repeats old statements. I noticed that Cushing inventories were flat. They were not at what I had read as the maximum inventory level, so I was confused (perhaps I misunderstood). This is the primary reason I looked at total inventories, which are clearly rising. It is not clear that Cushing is the problem. I am not so sure. The inventory rise in total PADD2 occurred already during in 2010 when there was no spread between WTI and brent. Reached 96 in sept (when your chart Fig. 9 ended), since then it is quite flat. In the period when the spread has begun to widen dramatically, since early Feb, the total inventory went up by merely 1% from 99 to 100. (see http://www.eia.doe.gov/dnav/pet/pet_stoc_wstk_dcu_r20_w.htm), there is no trend for increase in recent weeks – this is hardly a reason to support the price development. Or did perhaps market players need months to realise that there was a inventory build-up ? It may be that PADD2 is getting closer to maximum inventory, and this is an issue. Some of these pressures have been building over time. Bakken keeps pumping out more, and the new Keystone pipeline enhancement just came out in February.